Secondary payload 2: Sparrow, a 585 kg (1,290 lb) lunar lander from Israeli non-profit SpaceIL. Rideshare organized by Spaceflight Industries. News! SpaceILs CEO Dr. Ido Anteby says, "The #SpaceIL team & @ILAerospaceIAI have successfully completed the testing stage of the #spacecraft for refueling & assembling the launcher.... we are looking forward to the launch & the challenging journey ahead..."
Last edited by Dr Mordrid; 18th February 2019 at 19:01. Static fire test of Falcon 9 complete targeting February 21 launch of Nusantara Satu from Pad 40 in Florida. S5: Space Situational Awareness mission, a 60kg micro-sat from the US Air Force Research Laboratory. It's stated purpose is detecting and locating near-GEO objects to update the GEO catalog, but it could also keep track of those Russian birds which have been maneuvering around commercial and US GEO satellites. Last edited by Dr Mordrid; 18th February 2019 at 19:04. Good launch, a very high energy stage landing (3 engines to land) and now in coast before payload deployments. Highest reentry heating to date. Burning metal sparks from base heat shield visible in landing video. Fourth reflight scheduled for April. 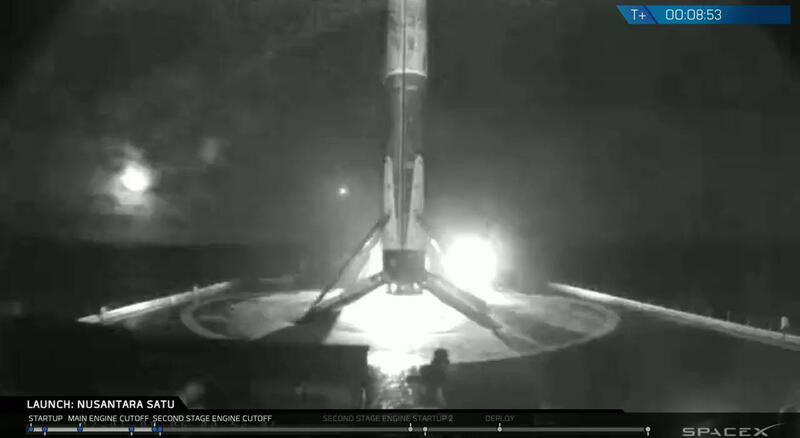 Falcon 9 first stage has landed on the Of Course I Still Love You droneship, completing this boosters third launch and landing. All times are GMT -7. The time now is 04:43.